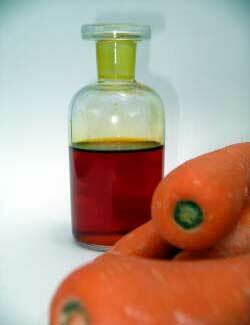 We present highly pure Carrot Seed Oil to the clients. The Carrot Seed Oil has a soft earthy smell that when applied increases the elasticity of the skin. The carrot seed blends well with perfumed woods, citrus and some spices. The Carrot Seed Oil is extracted by steam distillation from dried carrot seeds although the entire carrot plant can be used to derive the essential oil. Offering the most effective Essential Oils, we are reckoned as prominent Carrot Seed Oil Manufacturer and Exporter. It helps to fight many skin problems such as ulcers, boils, weeping sores, carbuncles, psoriasis and eczema. Its formative effect on the epidermal cells keeps wrinkles away and it also fights liver spots and that is why the Carrot Seed Oil is considered to be a premier essential oil for taking care of ageing skin. Since it is a powerful detoxifier and liver booster, the Carrot Seed Oil can help relieve stress and exhaustion. The oral intake of Carrot Seed Oil regenerates liver tissues and in aromatherapy literature it is stated that carrot seed operates as a kidney and liver cleanser.